Cancer, Lyme and other diseases – a connection? It was the word to avoid on a myriad of health forums. Until recently, that is. Now, it appears that sufferers of cancer, Lyme Disease and many other conditions are joining force, and that can only be a good thing. A uniting issue has been the use of GcMAF, the protein that has come to the fore globally, predominantly to fight cancer. It’s also having impressive outcomes for other health problems. This is because it helps the body to produce macrophages – a crucial part of the human immune system: “Macrophages play a significant part in immunity and immune responses. They assume a defensive role exhibited by their ability to carry on phagocytosis of parasites and microbes. They regulate lymphocyte activation and proliferation and they are essential in the activation process of T- and B-lymphocytes by antigens and allogenic cells. Enhanced bactericidal activity of ‘activated macrophages’ is based on immunologically linked mechanisms involving lymphocytes.” GcMAF stands for GcMacrophage Activating Factor, and it does just that and a lot more. However, the integrity of research on GcMAF, conducted by Nobuto Yamamoto and colleagues, has been questioned. This research originally prompted claims regarding cancer and HIV. It is no great surprise that Cancer Research UK has warned the public about spurious claims regarding clinical benefits, apparently misleadingly based on reduced levels of the alpha-N-acetylgalactosaminidase enzyme (also known as nagalase), whose production might be increased in many cancers. I feel tremendous empathy for the people suffering with cancer, who must be confused by contradicting information and may want to trust an alternative route but are dismayed by the negative press. I can only talk from experience. Whatever you research online, you will find polarised opinions. Perhaps this is the law of nature manifesting itself within the realms of virtual reality. I use GcMAF topically. It is easier and cheaper to apply it that way than through IV. The product is sold as skin cream and so evades certain legal restrictions. I had been applying it to the small area where lymph nodes are often sore, on my neck and under my ears. For the first time in ages, I had noticeably more energy. I began cycling again. I witnessed a profound improvement in my symptoms all round, but mostly had more energy. The sheer volume of positive feedback on relevant health forums is exciting. I’ve read heartfelt stories from people making progress for the first time in years. More progress is reported on the GcMAF forums than what I’ve seen on the forums for Lyme Disease, or any other related health forum. Some time ago, I realised that my lymph nodes are affected, or infected, and this must include what is known as Payers Patches. 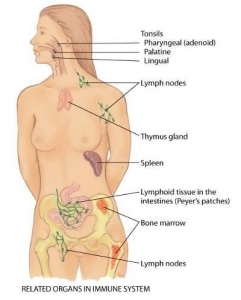 These are lymph nodes that reside in the gut. To activate lymphocytes in this area (remember we are activating our immune system, and lymphocytes play a big role therein), a novel approach has been developed. In truth, its the oldest trick in the book – yogurt, or fermentation. A brand of super gut healing yogurt called Bravo exists. At a hefty price of around $200 for the culture (you can make your own thereafter), there was little chance of me trying it. Fortunately, a forum friend posted a recipe to make it at home. This, apparently, does the same thing as Bravo but with cheaper ingredients. These are: fermented colostrum, Bifido (probiotic) cultures and a form of sulphate and oleic acid (from olive oil). You can read about it here. A Youtube video presented by Clive de Carle and to Dr Reinwald claims that another product called Rerum works even better than Bravo and that the combination of oleic acid, chondroitin and vitamins D3 and D2 are the most crucial components of Bravo yogurt. Only time will tell. Today, I had my first dose of the homemade colostrum MAF yogurt. I liked a comment posted below the Youtube video, which stripped the issue to the bare bones. This brought back the underlying element thatLyme Disease and cancer could have in common – fungus. Hello, Thanks you for discussing the details and actually maintaining the website. I just want to add that I used that and it helped me so much. me and motivate me to take the next step.